Has it come to the point already where the Bulls are playing spoiler? It looked a bit that way Tuesday as the Bulls lost at home 78-74 to the Milwaukee Bucks, who seemed well on their way to a top lottery draft pick with the poorest record in the Eastern Conference. But it’s not the first time the Bulls may have spoiled someone’s lottery dreams as the Bulls now have lost to the teams with the poorest records in both conferences. Mike Dunleavy was the offensive hope for the Bulls with a season-high 24 points, 18 in the second quarter. But it’s not easy when Thibodeau has rookie second round pick Erik Murphy the first substitute (Murphy got his fist NBA basket) with Joakim Noah a late scratch, joining Luol Deng, Jimmy Butler, and, of course, Derrick Rose sitting out with injuries. That’s four of the team’s top six scorers and starters as Thibodeau said afterward that Noah, who practiced Monday and participated in Tuesday’s shootaround, aggravated a thigh or injury above the knee earlier Tuesday. The result not only was a season low in points, but a disjointed, inefficient, blundering offensive game with 18 turnovers that led to 25 Bucks points, three quarters scoring fewer than 18 points and point guards Kirk Hinrich and Marquis Teague combining to shoot one of 17. There was a report by Yahoo Sports the Bulls may sign point guard D.J. Augustin, who was released by Toronto after the seven-player Rudy Gay deal. The Bulls, playing essentially a six-player rotation with Murphy and Nazr Mohammed playing about 10 minutes each, are piling up the minutes and losses, now 8-11 with losses in eight of the last 10. And Tuesday was the first of four games in five days and seven in 10 days, concluding with a brutal back to back in Houston and Oklahoma City next week. Even in the weak Eastern Conference, the Bulls could soon find themselves as one of the lottery bound teams as they’re only two games ahead of the Nets, who basically claimed the laughingstock title from the Knicks last week. Though it’s not as if the Bulls who are playing are giving up or giving in. They played hard; they fought over screens, covered the lane, switched on defense and outrebounded the Bucks, though the Bucks had three offensive rebounds in one fourth quarter stretch as the Bulls just couldn’t seem to make one or two key plays to steal back the game. Dunleavy’s hot shooting quarter, when he made all seven attempts, seemed enough of a boost to secure a win in this battle of the survivors. The Bucks were missing five rotation players, including at least two starters. But no excuses all around. 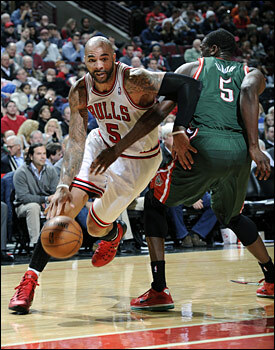 Carlos Boozer had 21 points and 12 rebounds against the Bucks. Don’t the Bulls know that. But they looked like they may have enough after that second quarter surge that put them ahead 42-35 at halftime and 48-37 a few minutes into the second half. But the Bucks, 5-16 (the Bulls play the 5-15 Knicks Wednesday), made two adjustments after halftime that changed the game for them. Dunleavy was getting open and making shots off their forwards, Khris Middleton and rookie Giannis Antetokounmpo. So coach Larry Drew went with three guards after halftime with Knight on Dunleavy. Then the Bucks sunk into a zone as the Bulls guards were shooting so poorly (seven for 31 overall) and by late in the game running away from shots. That led to forced passes inside to Carlos Boozer, who had 21 points and 12 rebounds, or Taj Gibson, who had 10 points and nine rebounds. With the Bucks thus packed in and little spacing, the result was multiple turnovers, which the Bucks turned into the points that made the difference in the game. It worked enough as Dunleavy got just two shots in the third quarter in 12 minutes, missing both as the Bucks closed the quarter with a 12-3 run to cut the Bulls lead to 57-55 and then opened the fourth with a 10-2 run (and 22-5 overall) to lead 65-59 with 8:30 left in the game after Henson got loose and dunked out of a half court set. Still, even with all that the game was still there to be taken back after the Bucks put Knight back on Hinrich. Dunleavy got free when the Bucks went big and stayed in the zone. Dunleavy came out beyond a down screen from Gibson and hit a three with 1:59 left to cut the Bucks lead to 73-72. Just like the Heat and Pacers were doing down I-65, these two teams were likely saying see you next time as the Bucks and Bulls play in Milwaukee Friday. The Bucks then got the clinching and unlikely play of the game from Henson. The second year big man put up big numbers, much beyond his 11.3 points and seven rebounds this season, obviously without Noah’s presence. Henson plays awkwardly, though his long arms make up for mistakes. He’s a good shot blocker as a result. But no one is going to teach his shooting style, which looks like a flamingo with diarrhea. The Bucks walked it up and Knight went over Henson’s screen as Henson faded out on top. Knight got cut off going left as despite his poor shooting, Hinrich was doing an excellent job getting over picks and staying tight as Knight and O.J. Mayo were a combined 10 for 35. Gibson came up to help and Knight threw back to Henson, who was needing of help of his own. He began spinning around on his pivot foot, waving the ball as the shot clock ticked down. With 1.9 seconds on the clock after nearly a half dozen ball fakes and apparent pleas for help, Henson turned with his back to the basket and then spun around and launched a high arcing shot that somehow swished for a 75-72 Milwaukee lead with 1:35 left. Gibson raised his arms in disbelief. 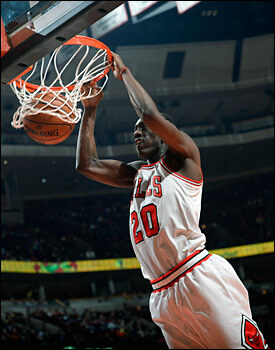 Tony Snell, the rookie who has borne up well, had 13 points and six rebounds. The Bucks stayed in their zone. Hinrich, by now zero for 10, was reluctant to shoot. As he went over a screen he passed back across court to Tony Snell. The rookie who has borne up well had 13 points and six rebounds. But he was slow and uncertain reacting to the defense again and held the ball and began to pump fake. After several, Ekpe Udoh switched onto him and blocked his rainbow attempt as the shot clock ran out with 1:12 left. The Bucks, as most teams do, continued to put Boozer in pick and roll and Knight pulled up for a 23-footer that missed with the Bulls still down three and about 50 seconds left. Knight switched onto Snell on the next Bulls possession. Snell beat him off the dribble from the left wing into the middle for a short runner. It barely missed and came off on the left side, where Boozer was waiting as Henson moved to help. But Boozer’s point blank tip once again rolled off and Milwaukee rebounded with 36 seconds left. Hinrich again nicely cut off Knight on a drive and Knight threw back to Udoh, who lofted an air ball giving the Bulls yet another chance with 13.1 seconds left and still down by three. But these offensive possessions were excruciating to watch and seemingly even more painful to play through as there seemed no one to create a shot or much get one for someone else. Assuming they were even inclined to shoot. In other words, don’t force a bad shot into traffic and get it outside. Of course, someone has to be able to make those jump shots. So now: Take a three? Quick two and foul with 13.9 seconds left? Dunleavy inbounded to Snell on top. He passed to Hinrich cutting on the right wing and toward the baseline over a Gibson screen. The Bucks seemed willing to give Hinrich the layup to get within one when he beat Ersan Ilyasova around the corner. But Hinrich passed up the shot and threw to Boozer cutting down the middle. As Boozer went up, Henson stripped him for one of his six turnovers and the ball went out of bounds to the Bucks with 6.2 seconds remaining. The Bulls fouled Ilyasova with 4.2 seconds left. He made both for a 77-72 lead with 4.2 seconds left. Boozer made a basket on the inbounds. But in an appropriate conclusion, he was assessed a delay of game and technical foul for touching the ball as it went through the basket and the Bucks shot a final free throw for a 78-74 final. It was another woeful start as the Bulls went down 20-14 after one quarter and now have lost three of their last four at home in the easier part of the schedule. They shot 25 percent in the first quarter as only Snell scored for the Bulls in the last seven minutes of the quarter. But former Buck Dunleavy used all his savvy coming off screens and making back door cuts to get open for his biggest quarter of the season in the second. With the Bucks also shooting poorly and sloppy with the ball, the Bulls took a late 40-31 lead. But again when they had a chance to extend it and perhaps knock out a losing club, they made turnovers with lazy passed and indifferent plays. “The main thing is we have to play hard and compete and grind it out,” said Dunleavy. “You can do that whether Joakim Noah or Luol Deng or Derrick Rose is in the lineup or not. That’s a mindset thing. That’s not a skill thing.